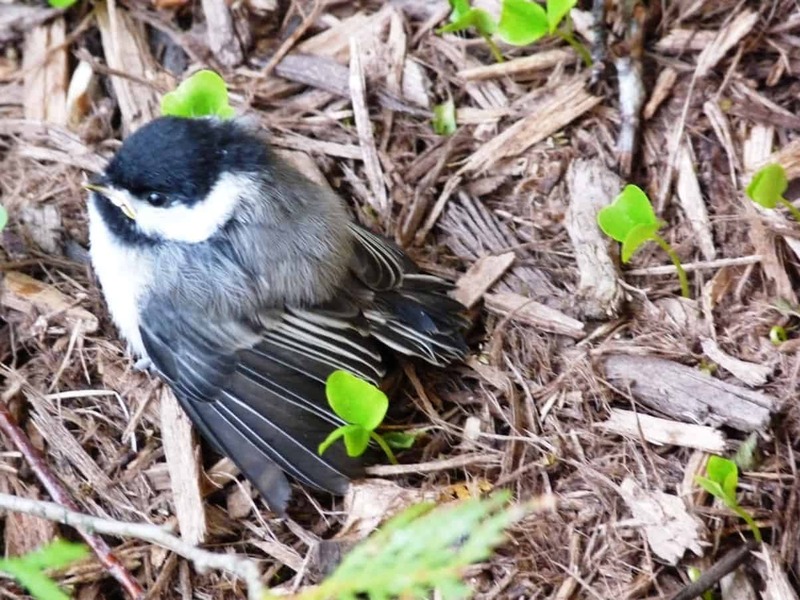 It’s hard not to love Black-capped Chickadees. Weighing no more than a handful of paper clips, their ability to survive long, cold winter nights and relative lack of food is nothing short of amazing. Although most people are familiar with chickadee behaviour at feeders – flying in, grabbing a seed and departing immediately – there is also a lot going on in the chickadee world that is not immediately obvious. However, by watching and listening closely, even at the backyard feeder, you can learn a great deal about their secret lives and interactions. A chickadee flock usually forms in late summer around a dominant pair of birds that has just completed a successful nesting. The flock will remain together until the start of the next breeding season. There are usually six to ten birds, but occasionally more if sufficient food is available. Some are paired adults, a few are single adults and the others are young birds born the previous spring. The latter, however, are generally not the offspring of the adult pairs in the flock. Other species, too, will often accompany chickadee flocks. 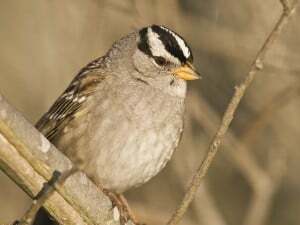 They include kinglets, nuthatches, woodpeckers and, in the spring and fall, warblers and vireos. It’s interesting to note that these other species respond almost immediately to chickadee alarm calls, and fly in to see what all the fuss is about. These alarm calls can be imitated by using “pishing”. More about that later. There is a surprisingly complex social system within the flock, which is based on a dominance hierarchy, or “pecking order”. Each bird is known to the others according to its rank. 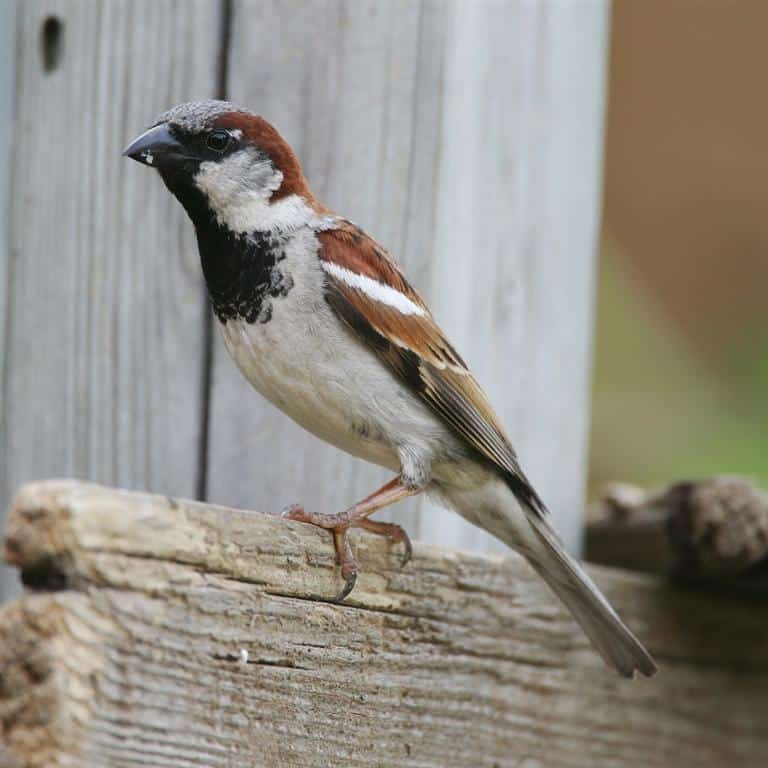 In general, older and more experienced birds are dominant over younger ones; males are dominant over females; and resident birds dominate intruders. The bird of lowest ranking is subordinate to all of the others. The rest have a ranking somewhere in between. Once a pecking order is established between two birds, it remains unchanged for years. Dominance can be expressed through vocalizations, body position, body size, chasing and sometimes even by fighting. A friend actually witnessed the struggle for dominance taken to a rare extreme. While walking in the Trent Wildlife Sanctuary, her attention was drawn to a particularly strident version of the familiar “chick-a-dee-dee call”. The sound was higher and contained more “dees” than usual. Seconds later, she noticed some rustling in the snow. Two chickadees were actually in combat! One bird was on top, and the other was lying on the snow with its wings quivering. The only sounds were the fluttering of the combatants’ wings and the calls of a third bird that seemed to be observing the scene. The tussle lasted for well over a minute. Dominant birds rarely need to fight subordinates, however, once the pecking order of a flock is established. High rank in the dominance hierarchy confers some important advantages. For starters, dominant birds enjoy the best and safest access to food. They tend to forage lower and closer to tree trunks than less dominant birds, who are relegated to the outermost parts of trees where an attack by a predator is more likely. At the feeder, the dominant bird can easily frighten all other chickadees away. High-ranking chickadees enjoy greater over-winter survival – especially the males. These males are also much more successful in pairing with female flock-mates, and they enjoy greater mate fidelity. A lower ranked male is often cuckolded by his partner who tends to look for sexual opportunities with a higher ranked bird. The female who is paired to the alpha male also enjoys better access to food and very little aggression from other chickadees. When the nesting season arrives, she will also lay more eggs than lower ranked females and her fledglings will have a greater chance of survival. 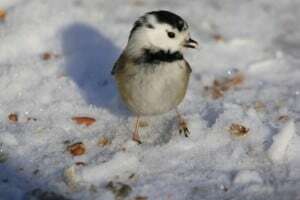 Chickadees have also evolved special adaptations to survive freezing temperatures. One way they do this is by stuffing themselves with food each day, often gaining 10 percent of their body weight. They then minimize energy use (i.e., burn less food) at night by going into a state of hypothermia. When darkness falls, a chickadee is able to lower its body temperature by up to 10 C below its normal daytime temperature. This produces an energy saving of almost 25 percent. That’s a lot of sunflower seeds! In cold weather, chickadees will often spend the night in a small tree cavity. They are able to excavate these roosting holes themselves in rotting wood. Birch is a favourite species for this purpose. The bird wedges itself in the hole, puffs up its feathers to trap air, drops its internal thermostat and burns fat all night. Considerable research has been done in recent years on chickadee songs and calls. Both are complex and language-like. Thirteen distinct types of vocalizations have been identified. 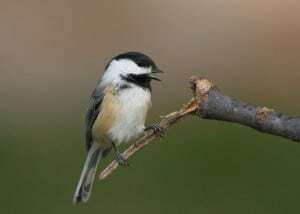 The well-known “chickadee-dee-dee-dee” call, for example, is sometimes used as a predator alarm. The more “dees” in the call, the higher the perceived level of threat. February and March are courtship months, and males can often be heard whistling their clear, descending, two or three note song. The second note is a whole-step below the first. A common mnemonic is “Fee-bee” or “Fee-bee-bee”. I like to think of it, however, as “Hi Sweetie”, since chickadees usually start singing around Valentine’s Day. Sweetie just seems more appropriate! The song increases in frequency as the winter advances and serves to advertise ownership or establishment of a nesting territory and to attract a mate. 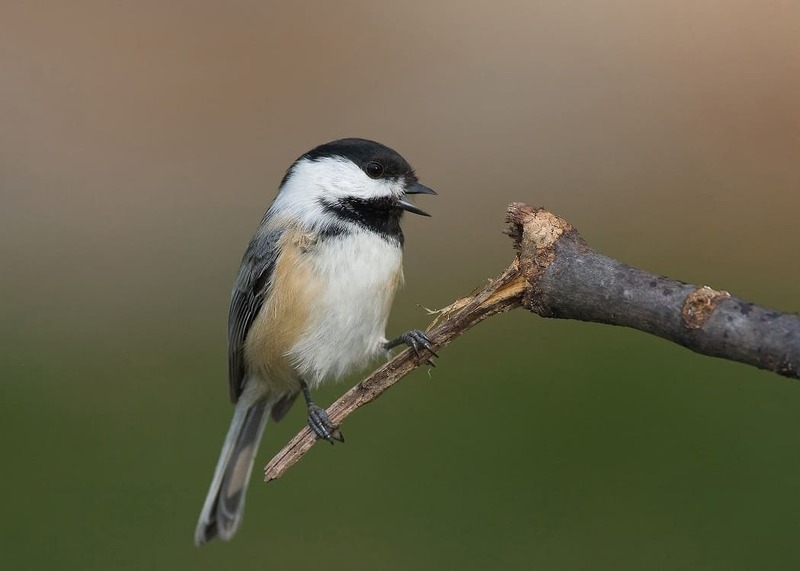 Chickadees sing a great deal at dawn during the breeding period. Songs are also produced during the day in aggressive “countersinging” exchanges, where two males “duel it out” in song. Both frequency matching and song overlapping are important components of countersinging behavior. Females, of course, are listening in. Male performance during such exchanges influences female reproductive behavior. If a male in a neighboring territory out sings her mate, the female will sometimes fly off to the neighboring territory to seek an extramarital adventure! 1. When chickadees come to your feeder, watch for short chases between members of the flock. This is an expression of dominance. Dominant birds will approach the feeder directly, scaring off other flock members. You will often see lower-ranked chickadees approach the feeder and then veer off without landing. 2. Can you find any of the seeds the chickadee hides? Seeds and other food items are placed in hundreds of different hiding spots, and the chickadee is able to remember them all! 3. Everyone (and especially children!) should have the experience of hand-feeding chickadees. Feeling the clutch of tiny feet and the brush of feathers is unforgettable. 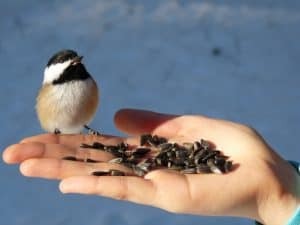 With patience and determination, you can train the chickadees at your feeder to feed from the hand. If you haven’t done so already, set up a feeder with black oil sunflower seed. Keep it well stocked. Go outside each day and stand quietly about six feet from the feeder, allowing the birds to feed. Move in a bit closer as the birds become more comfortable with your presence. Eventually, the birds won’t mind if you stand right beside them. Next, take away the feeder all together, and fill a small bowl with sunflower seeds. Hold the bowl with your arm outstretched, right where the feeder was. The trick is to keep perfectly still – even your eyes. After the birds are comfortable eating from the bowl, hold the seeds in your open hand instead. Soon you’ll be experiencing “that chickadee feeling”. Invite friends and family to try it too. 4. Chickadees are easy to attract by “pishing”. You can pish in chickadees in your own backyard or anywhere else you encounter the birds. Standing close to trees where the birds can land, pucker your lips and make a loud, forceful “shhhh” sound, all the while tacking a “p” on at the beginning: Pshhh, Pshhh, Pshhh… Make sure it sounds shrill and strident. Pish in a sequence of three, repeating the sequence two or three times. Wait a while and do it again. At first you’ll need to pish fairly loudly, but you can lower the volume once the birds get closer. With any luck, the chickadees will approach to within three or four feet. Nuthatches, woodpeckers and other birds may be attracted, as well. Just don’t give up too soon. 5. 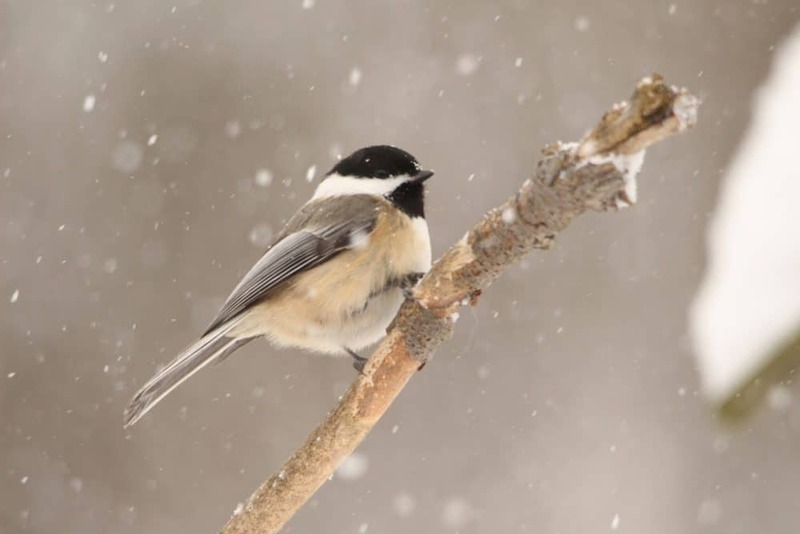 Like most birds, chickadees prefer feeders with nearby natural cover such as evergreens. This gives the birds an area to hide quickly when threatened as well as a protected night roost. I planted cedars for this purpose. 6. If you want chickadees to nest in your yard, build or purchase a birdhouse with a 1 1/8-inch entrance hole. Place the box at least five feet above the ground, near cover and facing away from the prevailing wind. Boxes should be placed outside by mid-March. Plans can be found at nestwatch.org. In the wild, chickadees usually excavate a nesting hole in the rotting wood of a standing tree or enlarge an abandoned cavity dug out by a woodpecker. A citizen science workshop entitled “Electronic Record-Keeping of Observations” will be held on Saturday, February 18, beginning at 1 p.m. at the Camp Kawartha Environment Centre, 2505 Pioneer Rd. The workshop will introduce eBird and eButterfly, two internet-based systems used to keep bird and butterfly observations recorded on centralized computer databases. For further information, call Martin Parker at 705-745-4750. Have you noticed “missing birds” too this spring? For years we’ve enjoyed numerous chickadees, winter and summer along with goldfinches and others. This year, both are literally non-existent. 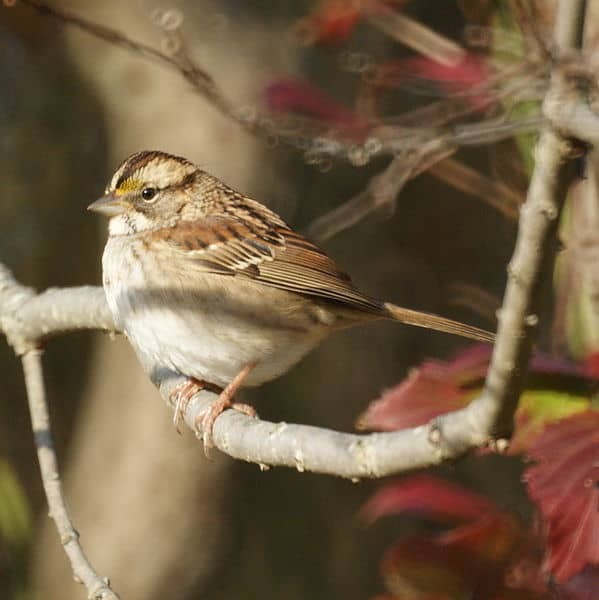 Nor did I see the usual spring showing of White-throated and White-crowned sparrows. We still get cardinals, jays, a few woodpeckers, including the Pileated, and the occasional nuthatch, along with grackles, doves and pigeons. Any logical explanation? Note: A number of people have commented this spring on the same phenomenon, especially with regard to chickadees. At first I thought it was just because they are nesting now and tend to visit feeders much less during that time. That being said, I don’t recall hearing this observation in past springs – at least with regard to chickadees. I noticed the same lack of sparrows, too, this spring. I only had only two White-crowned Sparrows and not a single White-throated. The latter is usually abundant in my yard during spring migration. The only thing I can think of is that weather conditions were such that the birds simply flew straight over our area without lingering here like they usually do. Not sure that could be the whole story though. I’d be interested in hearing from anyone who has noticed the same thing, especially with regard to chickadees and white-crowns/white-throats. D.M.